Festivals of Faith: Reflections on the Jewish Holidays is a collection of Rabbi Norman Lamm’s thoughts on the Jewish holidays culled principally from his sermons and divrei Torah delivered while he was Rabbi of The Jewish Center in New York City. Each discourse is an individual gem, and together they constitute a treasure trove of profound insights and inspiring teachings. Spanning the entire year, Festivals of Faith contains several selections for each holiday. Those familiar with Rabbi Lamm and his work will find numerous examples of Rabbi Lamm’s consummate ability to captivate his audience with intellectually compelling concepts masterfully expressed in his eloquent style. 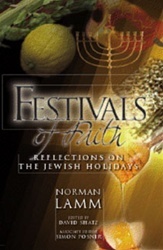 For those who have not yet enjoyed Rabbi Lamm’s work, Festivals of Faith is an excellent introduction to his unique message for the contemporary Jewish community.